Cold Steel XHP Recon I Limited Edition CS27TLCTH. Cold Steel has put all the works into the Recon I. This is a four inch blade that has a razor sharp tanto end and half serrated and half plain edge. Dual thumb studs to open this up. Keep a steady grip on this black handle that has G-10 scales and nice deep finger grooves. Pocket clip that can be changed from left to right. Lock back mechanism to hold blade while in use. Handle is 5.25 inches long and overall length is 9.25 inches. 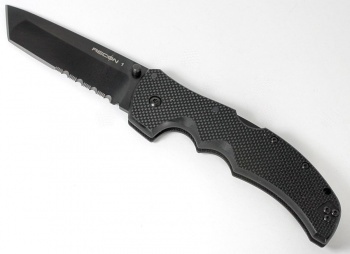 Do you own Cold Steel XHP Recon I Limited Edition CS27TLCTH? Tell us about it! Have a question? Ask!